To sell the inventory of HUD-acquired properties in a manner that expands home ownership opportunities, strengthens neighborhoods and communities, and ensures a maximum return to the FHA mortgage insurance fund. Office - Contact the appropriate HUD Homeownership Center (see http://www.hud.gov/offices/hsg/sfh/hoc/hsghocs.cfm) or HUD Field Office listed in Appendix IV of the Catalog. 49,381 homes were sold in Fiscal Year 2007. The Single Family Property Disposition Program is the marketing and sale of one to four unit properties acquired by HUD after foreclosure of an FHA-insured mortgage. Within the general program there are special disposition programs through which a portion of the property inventory is sold. These programs are referred to collectively as the Good Neighbor Initiatives and include Good Neighbor Next Door Sales program for law enforcement officer, pre-K through 12 teachers and firefighters/emergency medical technicians, Discount Sales to Nonprofits and Local Governments program and $ HOME Sales to Local Governments program. Information for each of these programs is covered separately. The majority of foreclosed one to four unit properties are sold through the general disposition program. HUD contracts with private companies to manage and market the properties. Properties are listed for sale by each company for the company's contract area; generally, a state. The listings may be viewed by going directly to the contractor's website or visiting HUD's website at http://www.hud.gov/offices/hsg/sfh/reo/goodn/dhmabout.cfm, where you will be directed to the listings for your state. The listings provide the appraised value of the property, the property address, a brief description of the property and access to a Property Condition Report prepared by the contractor. Complete information explaining the sales process and earnest money requirements is also available. Bids must be submitted electronically by a real estate broker. An earnest money deposit is required with each bid submitted. Special opportunities are available for bidders who intend to occupy the purchased property as their personal residence. Properties not purchased during this Exclusive Listing Period are then available for the general public, including investors, during an Extended Listing Period. FHA financing may be available for purchasing many homes, including the FHA 203(k)and 203 Special (k) program providing a loan to purchase a property and pay for repairs or improvements as permitted by FHA rules. Interested persons should contact their FHA approved lender. Refer to http://www.hud.gov/ll/code/llplcrit.html for assistance in locating a lender. Local Governments and Nonprofit Organizations: HUD contractors in the specific area should be contacted regarding eligibility requirements. Contact HUD at Tollfree: (800) CALLFHA or (800) 225-5342 for a listing of nationwide HUD contractors. FHA Insured Financing: Generally, anyone who has a satisfactory credit rating; enough cash to close the loan; sufficient, steady income to make the monthly payments without difficulty; and who will live in the home can be approved for an FHA insured mortgage. Income is only one of several factors that apply in the lending process. Interested buyers should contact their lender for more information. Individual, governmental and organizational homebuyers. Nonprofit Organizations must have IRS 501(c)(3) status. 12372, Intergovernmental Review of Federal Programs (or consultation with State and local governments regarding program design). HUD homes are managed and marketed by private contractors. A list of contractors and the areas each serves may be found at http://www.hud.gov/offices/hsg/sfh/reo/mm/mminfo.cfm. The contractors list all HUD homes for sale on their individual Internet websites . Bids for a particular property can be submitted online. Purchasers must secure financing of their choice. FHA financing may be available. A list of HUD approved mortgage lenders is located at our website, http://www.hud.gov/ll/code/llslcrit.cfm. Properties are generally sold awarded to the highest bidder. Direct sales may be made where permitted by regulations. Bids must be submitted by the closing date indicated in the listings. National Housing Act, as amended, 12 U.S.C 1710, Sections 203(b), 203(k), 204, 24 CFR 200. 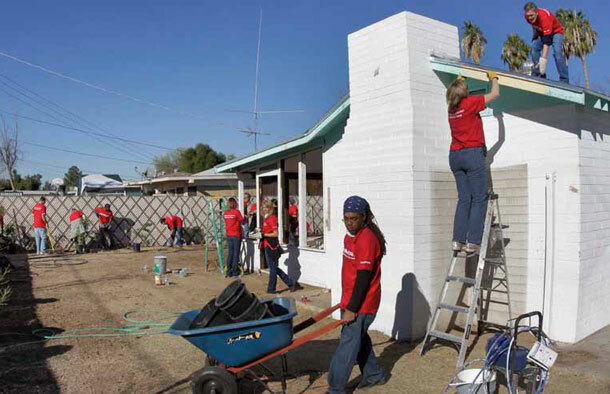 Nonprofit organizations purchasing homes at a discount must submit an annual report (see http://www.hud.gov/groups/grantees.cfm). Nonprofit organizations purchasing homes at a discount must retain information about the acquisition, rehabilitation and resale of discounted properties. This includes copies of HUD-1 Settlement Statements for the resale and other documents (see http://www.hud.gov/groups/grantees.cfm). (Sales) FY 07 $3,370,036,717.00; FY 08 est $6,568,648,990.00; and FY 09 est $6,722,144,770.00. 10 to 30 percent discount off list price for Local Governments and Nonprofit Organizations. HUD Regulations at 24 CFR Part 291. Program information is available on HUD's website at http://www.hud.gov. Contact the appropriate HUD Homeownership Center (see http://www.hud.gov/offices/hsg/sfh/hoc/hsghocs.cfm) or HUD Field Office listed in Appendix IV of the Catalog. For policy questions, contact the Asset Management and Disposition Division, Office of Single Family Housing, Department of Housing and Urban Development. Telephone: (202) 708-1672 (this is not a toll free number).